Hello. I'm from Portugal and since some time a go a have Kanotix (KDE x64) installed in my laptop (great OS, very stable). In this laptop I have LibreOffice 5.4.3.2 and everthing works well. 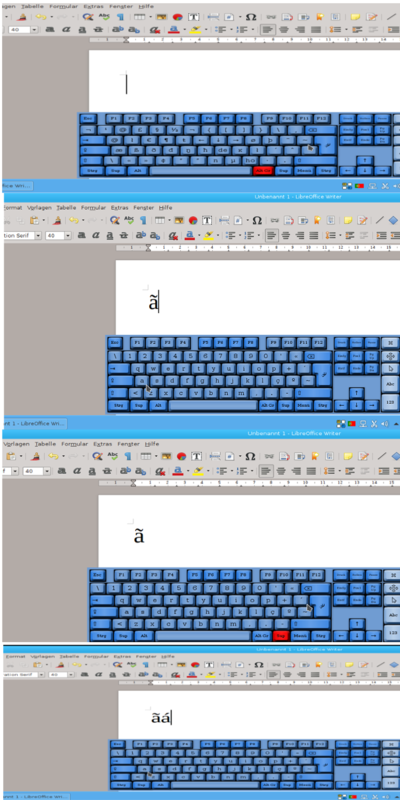 Now, I have another laptop and I also installed Kanotix (KDE x64) but in the new LibreOffice 6.1.3.2, I can't write some portuguese characters with accents, like "á" or "ã". If possible, I apreciate some indications to solve the problem. Excuse my not good english! By my hardware keyboard de and keyboard pt in the panel on flag. With key Alt Gr +`~ its ok!